As Fiat prepares to re-introduce itself to America lets take a look at how it went about its first introduction. 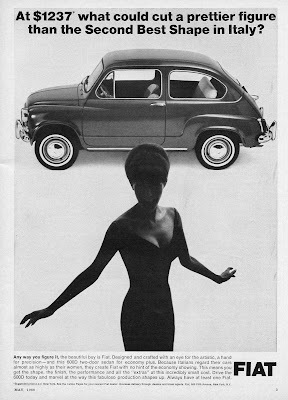 "Italians regard their cars almost as highly as their women" will most likely not appear on any modern Fiat 500 ads. Even though a low cut dress is a proven way to move metal, its simply too patronizing these days. Especially the way the ad portrays doing so as a particularly Italian endeavor.